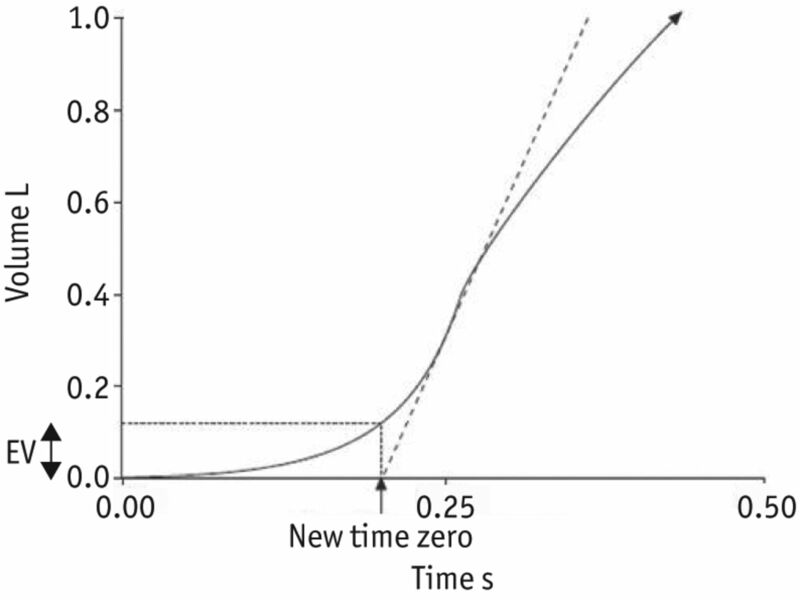 Expanded version of the early part of a subject's volume–time spirogram, illustrating back-extrapolation through the steepest part of the curve, where flow is peak expiratory flow (PEF), to determine the new time zero. Forced vital capacity (FVC): 4.291 L; back extrapolated volume (EV): 0.123 L (2.9% FVC). -----: back extrapolation line through PEF. Reproduced from  with permission from the publisher. Flow–volume loop of a normal subject. Forced expiratory volume in 1 s (FEV1): 105% predicted; forced vital capacity (FVC): 103% pred; FEV1/FVC ratio: 89%. 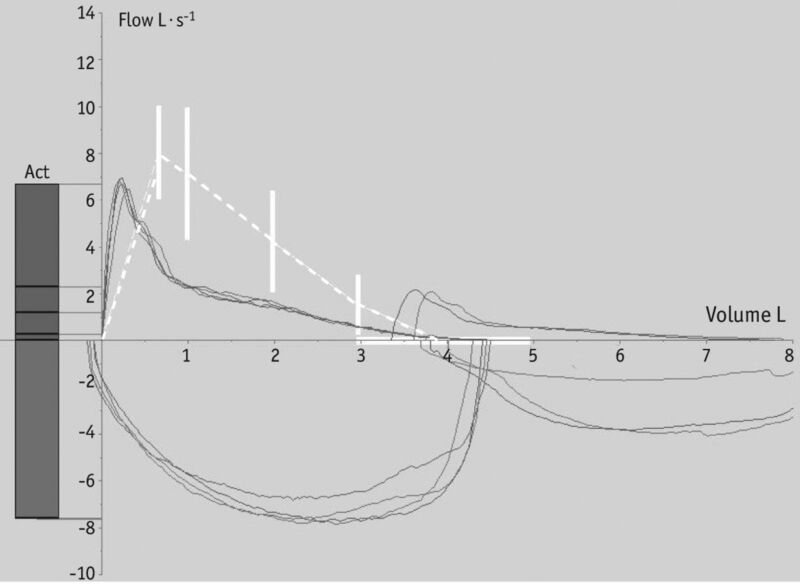 The plot shows the predicted flow–volume loop (-----) and predicted ranges for the peak and mid-expiratory flow rates and the FVC. Moderate airflow limitation in a subject with asthma. 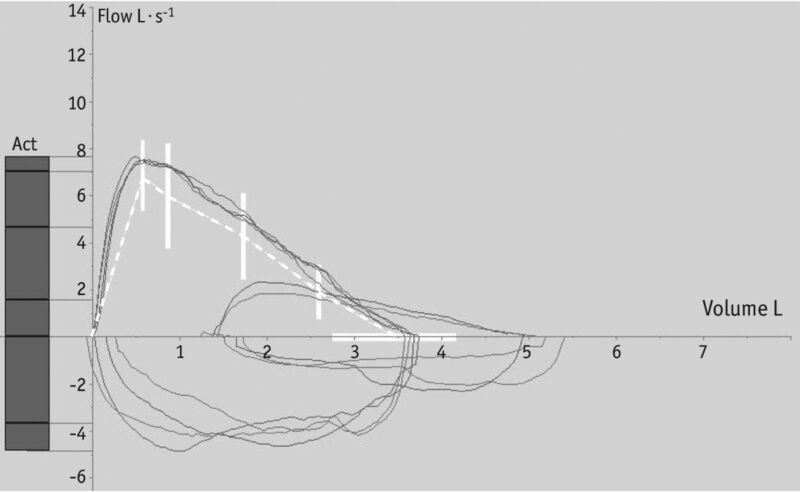 Forced expiratory volume in 1 s (FEV1): 73% predicted; forced vital capacity (FVC): 109% pred; FEV1/FVC ratio: 53%. Example of a typical restrictive defect. Forced expiratory volume in 1 s (FEV1): 82% predicted; forced vital capacity (FVC): 85% pred; FEV1/FVC: 84%; peak expiratory flow: 157% pred. 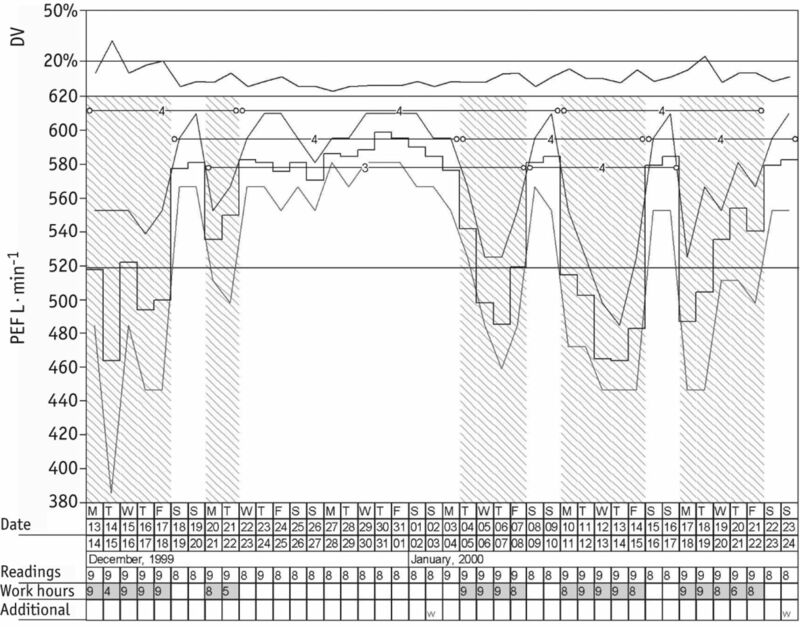 Serial peak flow plot showing occupational asthma in a worker exposed to formaldehyde. The top part of the plot shows the diurnal variation (DV), the middle section shows the highest peak expiratory flow (PEF), mean PEF and lowest PEF each day. Shaded areas are work days and white areas are days away from work. The Oasys complex scores (a complex is either a rest–work–rest or work–rest–work pattern) are shown and the predicted PEF line of 519 L·min−1. The bottom section shows the date, number of readings per day and number of hours worked. The overall Oasys score is 3.93 (≥2.51 is positive for occupational asthma). 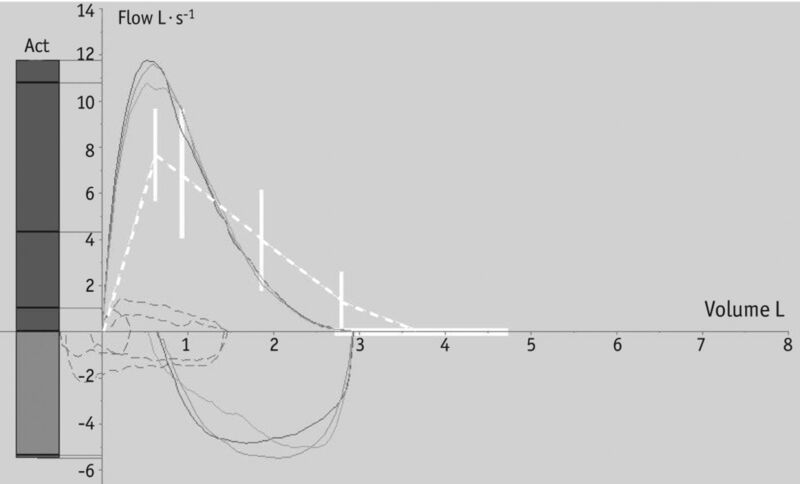 The area between curves score is 80.4 L·min−1·h−1 (≥15 L·min−1·h−1 is positive for occupational asthma) and time-point analysis is positive for occupational asthma. #: values are post-bronchodilator and used in combination with an FEV1/FVC ratio of <0.7.